Inspector Montalbano is a fictional character created by the Sicilian writer Andrea Camilleri in a series of novels and short stories. The character was then adapted for TV. The main character, Salvo Montalbano, lives and works in the fictional town of Vigàta, in the equally fictional district of Montelusa. Our suggested itinerary follows in the footsteps of the Italian detective ‘Inspector Montalbano’ and visits some of the most important historical sites to be found in the south eastern corner of Sicily. Arrive at Catania airport, collect your hire car and drive to Il Granaio in Modica. Dine at the same restaurant (meal payable locally) as Inspector Montalbano, the ‘Eusebio’ at the Hotel Eremo della Giubiliana in Marina di Ragusa. This former convent-fortress, dating back to the 1500s, is where some scenes from ‘The Voice of the Violin’ were shot. Overnight at Agriturismo Il Granaio. Spend the morning leisurely wandering around the UNESCO World Heritage Site of Scicli (17km). Scicli is full of wonderful baroque architecture, in particular Palazzo Beneventano and Palazzo Fava, and is framed by rocky cliffs. The Montalbano TV series is set in Scicli which doubles as the fictional town of Vigàta. Visit the town hall (Municipio) which is Montalbano’s office (Commissariato di Vigàta). Just a few metres away is the Palazzo Iacono on via Mormino Penna, which represents the Questura of Montelusa (Police station). Don’t forget to pay a visit to the bakery ‘Pasticceria Basile’ on viale I° Maggio for a welcome taste of Sicily. In the afternoon, head towards Donnalucata (9km) and its marina, which is used as the marina of Vigàta in ‘The Shape of Water’, ‘The Voice of the Violin’ and the ‘Cat and Goldfinch’. Continue along the coastline up to Punta Secca (15km), a small fishing village and the fictional home of Montalbano (Marinella). After breakfast, head to the Castello di Donnafugata (37km), a new-gothic mansion that dates back to the 1800’s. The house is the fictional home of Balduccio Sinagra, the local mafia boss, who meets Inspector Montalbano in the episode ‘Excursion to Tindari’. En route to Ragusa, stop at Grotta delle Trabacche, an ancient cemetery from the Roman period, where Montalbano finds two dead bodies in the episode ‘The Terracotta Dog’. Continue on to Ragusa Ibla and have lunch (not included) at La Rusticana which is the ‘Trattoria San Calogero’ in the series, on Corso XXV Aprile, where Montalbano normally lunches. Visit the town’s main square, Duomo di San Giorgio, which doubles as Vigàta’s fictional square. Stroll through the characterful streets, steeped in baroque architecture. Morning at leisure in Modica (9km). Visit another baroque jewel which is also the setting for many episodes including the Duomo of San Giorgio, which was used in the episode ‘Excursion to Tindari’. Take time to enjoy some of Modica’s delights including the local dark chocolate produced from an ancient Aztec recipe. In the afternoon, head towards Marzamemi (46km), a tiny fishing village where the main square, Piazza Regina Margherita, is bordered by ancient houses, two churches, bars, restaurants and the Palazzo del Principe di Villadorata. Drive to Syracuse (75km), a former Greek city which boasts many ancient artefacts from the period. Visit the island of Ortigia which has an enchanting historical centre dominated by its Cathedral (Duomo), with a dramatic baroque façade. 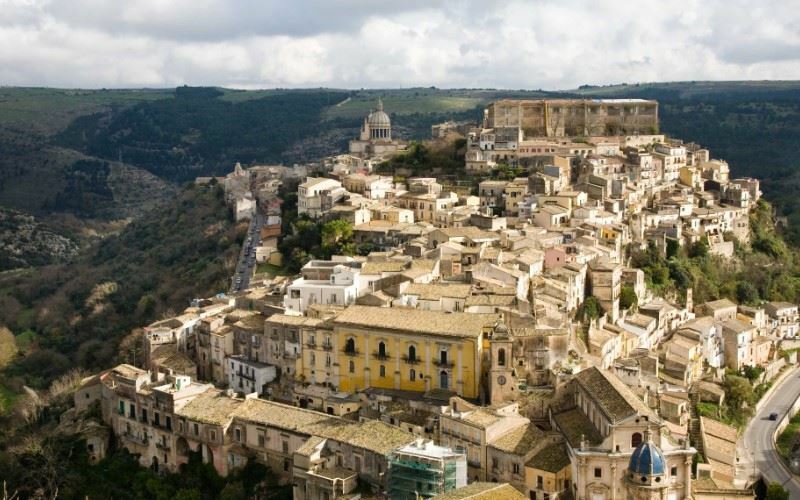 Continue south to the town of Noto (39km), destroyed in 1693 by a tragic earthquake, and then entirely rebuilt in the new baroque style. Visit the Villa Romana del Casale in Piazza Armerina (111km). This Roman manor house, declared a UNESCO World Heritage Site, boasts the largest, most complex collection of Roman mosaics in the world, many of which have been recently restored. Spend the afternoon in Caltagirone (31km), noted for its Sicilian ceramics industry which dates back over a thousand years. The main landmark of the city is the 142-step monumental staircase of Santa Maria del Monte, built from 1608 in the old part of the town. Each step is adorned with different hand-decorated ceramics. Free time in Modica to enjoy some last minute shopping or simply relax by the pool. Drive to Catania airport for your return flight home.